By now you probably already guessed that at Delacor, we are a group of LabVIEW and National Instruments hardware products geeks. We normally enjoy NI week a lot, but NI week 2016 was very special to us. 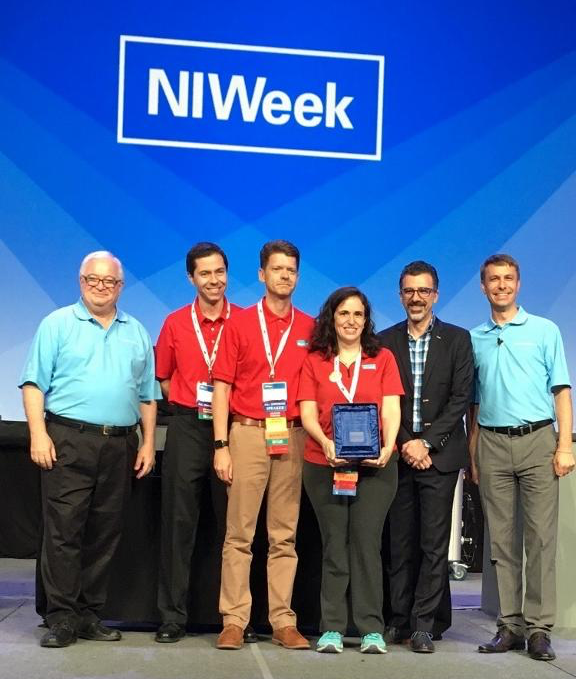 The Delacor leadership team receives the LabVIEW Tools Network Product of the Year award. [2nd Edit] If you want to get more videos from NI week presentations, check out this LAVA post. By the way, if you attended one of our sessions, please don’t forget to fill out the survey. Surveys help us improve our presentations and result in improvements to NI Week in general, like this year’s Advanced Users track, powered by LabVIEW Champions, which was a direct result of previous years’ survey results. Next, our customer Jeffery Bouchard from Biostage won two NI Engineering Impact Awards for their paper Regenerating and Restoring Organ Function Damaged by Disease or Trauma. Jeffery has been programming in LabVIEW since LabVIEW 1.0! The first award was in the category of Research and Development, and his second award was in the Humanitarian category, which is hand-picked by Jeff Kodosky. Jeffery was happy to finally meet one of his heroes, and having been selected by Jeff was the extra cherry on top. Jeffery was on the keynote on day 3 describing their application. I was honored to join him at the awards ceremony. My only regret is that I arrived to the LAVA BBQ at the very end. If all that was not enough, the LabVIEW Architects Forum won the best Advanced LabVIEW User Group award. Allen Smith and I founded this group several years ago. We meet once a quarter at National Instruments headquarters, and anyone can join remotely or watch videos of our meetings at our LAFtracks youtube channel. It was a great week, and we are already gearing up for the next NI Week, which will take place in Austin, Texas on May 22 – 25, 2017. Congratulations Fab and Chris.Happy for all of you. We hope you are doing well too and hopefully we will see you at the CLA Summit next year?